Regularly someone from around the globe emails me asking if I think doing a Sasin MBA would be a good choice for them. Such a question is rather hard to answer since it totally depends on what you are expecting to get out of it. 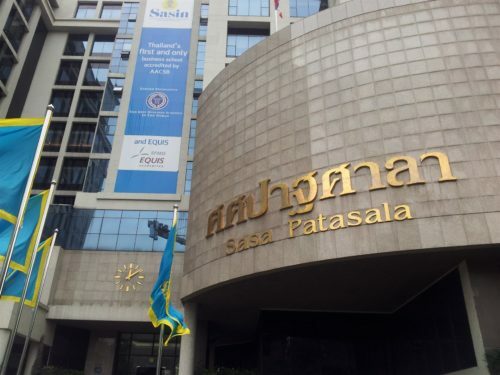 And while it is easy to imagine the great things that can happen during 2 years of studying in Thailand, I would like to share some of my observations here which you should consider before applying for your MBA at Sasin. One of the things that surprised me during my 2 years of studying at Sasin was that my classmates had very limited work experience. Most of them had worked 1-2 years in a Thai company which is very hierarchical, meaning they were told what to do and no analysis or input was needed, or worked in their family company, meaning they help their mum/dad with everything that comes along during a day. By itself that is no problem but it became pretty clear during the year that people lacked an understanding of how to set up an organizational structure; leaders and representatives were picked based on popularity and age instead of skills and vision, meetings were held without decent minutes being taken and actions points with deadlines being assigned, and no checks and balances were implemented at any stage. Several smaller “organizations” or “committees” have been set up in our class, all financed with our class fund, but nobody knows what has been accomplished and where the money went besides the insiders. Age does not say everything, but in Thailand you can bet your monthly pay a group of relatively young age won’t have much work or life experience. Maybe I am completely wrong with the observation of lack of work experience but that would then be due to the lack of participation in class. Many books covering the MBA experience explain that about half of the knowledge you gain comes from the professors while the other half comes from your classmates. But to accomplish that they will need to open their mouth every now and then. In our class about 20% of the people did 80% of the participation and there must be at least 20% of our class who never participated out of their free will during the whole 2 year program. Many professors were seriously frustrated when there was no reaction at all to even the most simple questions leading one professor to yell that you better learn how to ask “do you want fries with that?” as preparation for your next job . Sasin prides itself on offering an international education founded with collaboration of Kellogg and Wharton. 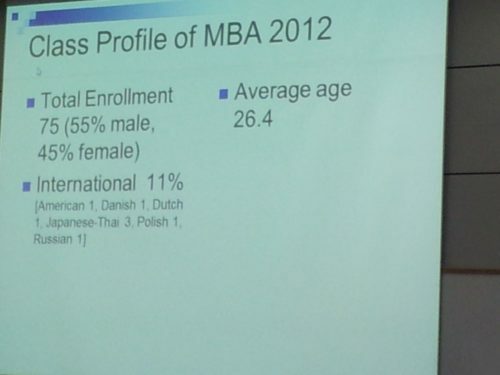 Most professors are foreign and all classes are held in English. But of the 70+ people in my class only 5 were foreigners. 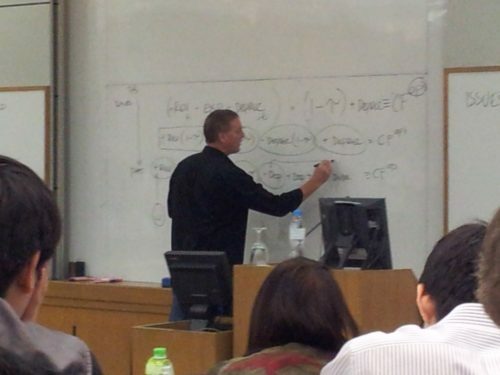 The consequence of this is that while the classes are in English, almost everything outside of class is in Thai. Many people were comfortable to switch to English when foreigners were present but I also heard of people who refused to have foreigners in their groups as they would rather stick to speaking Thai. 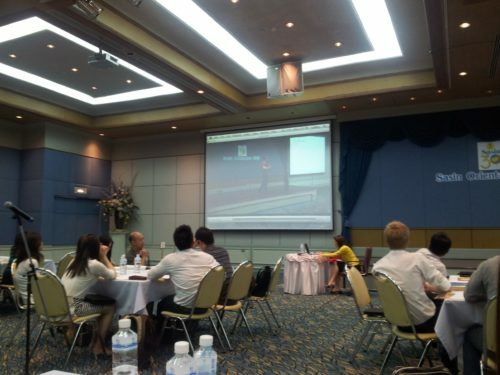 Sasin does offer exchange programs though, but from observation I noticed most people prefer to go abroad with their closest classmates, who are also Thai, and they mainly meet up with other Thais who are already studying at their exchange university. So far for exploring how business is done in other cultures and stepping out of your comfort zone. 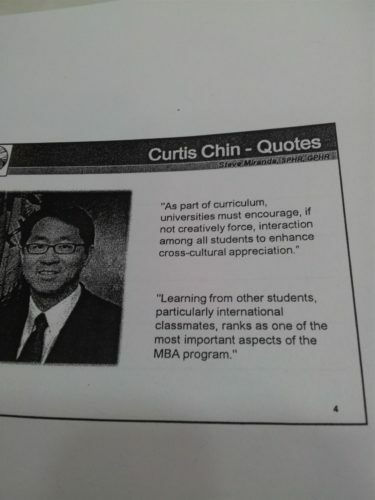 Curtis Chin, who was a guest speaker for the HR class of Steven Miranda, made two exceptionally strong remarks that Sasin should take to heart. While we had a limited number of full-time international students at the start of the program we did have 2 dual-program foreign students who stayed a year and many international exchange students. The least we could have accomplished was more mixing up, even if it only meant Thais working with other Thais than their best friends only. While the observations above might come across as negative I must say that while it applies to a large part of my class there are always positive exceptions: people who have had an interesting career in several countries before coming to Sasin, people who not only simply participate but even have the skills and knowledge to shine a new light on what is the professor is telling, people who actually pick an exchange program to jump out of their comfort zone by going alone to a country they know nothing about and study seriously there, and people who have no problem of working together with different students every module. Is the Sasin MBA program something for you? The best advice I can give anybody who considers studying at Sasin is that they have to think very long and hard about what they want to get out of it. You can just sign up and go through 2 years of education without clear targets but you most likely end up with near to nothing. It does not matter what your goals are: gaining knowledge, getting connections, having a sabbatical, exploring Thailand, finding yourself, but it should be worth 2 years of your time and >1.5 million baht. Self-improvement: volunteering for presentations no matter the size of the audience and if I feel comfortable with it. For example one of my goals was to improve my presentation skills as I had no confidence to stand in front of an audience or speak up in a large group. So during the first course I volunteered to give a short presentation on stage in front of 75 people who I did not know and from there on I did almost every presentation of group work possible and participated in class regularly. Besides that I shared my opinion on about every class issue coming by. Maybe not everybody liked all my comments, I am pretty sure of that as it goes against the Thai culture where nobody speaks up or has an opinion, but at least I practiced some skills that will be very helpful for my further career. All together I really enjoyed my 2 years at Sasin and I do not regret it one bit. But if it will be just as useful for you will depend on yourself.